2016 Mortgage Application: Will It Hurt My Credit? Front-End Ratio: This is also known by its alternative “housing ratio” and it is the calculation of all your home-related expenses which is then divided by your gross income. In your housing expenses would be: Mortgage, property tax, HOA fees, and insurance. Back-End Ratio: This ratio takes into account your housing expenses PLUS all other debts you pay on a monthly basis. This would include auto loans, credit cards, student loans, or any other monthly loan. You may be wondering which of these ratios you should pay more attention to but lenders will normally put more emphasis on the back-end ratio as it is taking into account all your monthly debts and not just your housing expense. This doesn’t mean that they will ignore your front-end ratio, but normally if your back-end ratio falls in line with their requirements, you should be good to go. 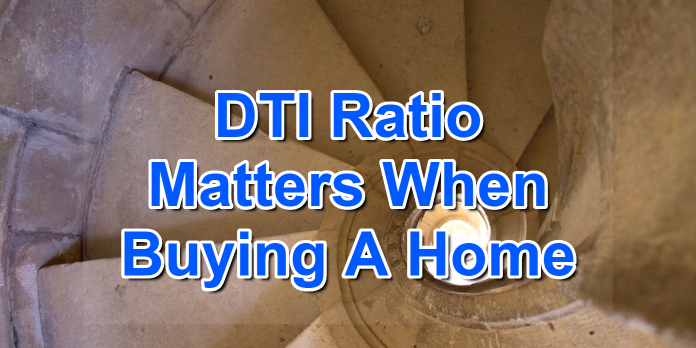 Realistically, you should try and keep your DTI Ratio as low as possible when looking to get approved for a home as it can only help you achieve that lender approval. The above ratios aren’t necessarily what will be approved at every lender as some will have lender overlays which will want an even lower DTI Ratio than is required so that it satisfies their internal risk on the loan. Obviously, the higher your DTI ratio, the higher risk a potential lender will see in you, and even if you secure a loan, you may still have some troubles making that payment every month you are now locked into. In advance of obtaining your mortgage, or even after you get your mortgage, it is always wise to keep your DTI Ratio in check to prevent financial strain. If possible, you should look to avoid taking on additional debt. If you wait until after you purchase a home to buy a car, you are doing yourself a disservice. Will you be approved for a car? Sure, but now your DTI Ratio is increasing unnecessarily. You can also try to pay down your credit cards or try to refinance or pay down other loans you may have. Any little bit helps when taking on a mortgage. Your mortgage will normally be your biggest monthly expense and you want to make sure you can handle it every month. If you think you are having troubles with your DTI Ratio, please feel free to reach out to e and we can walk through you credit profile and work on getting you approved. Please feel free to call me at 888-900-1020, email at contact@loanconsultants.org, or visit my website www.loanconsultants.org. I look forward to helping you any way I can.